If you are a do it yourself kind of person, you may have projects that will require you to tackle them with a finish nailer. These kinds of projects might include outdoor projects on your deck or patio, adding to the exterior of your home, or putting up lights near a hot tub. You might choose a finish nailer for indoor projects, including decorative purposes, trim, or ceiling tiles that you might want to change or replace. These purposes are a lot more common than you would expect, so having a great quality finish nailer in your possession can really make these home projects a lot easier and more impressive! 1 Types Of Finish Nailers - Which Type To Choose? Types Of Finish Nailers - Which Type To Choose? Just like a lot of other home improvement tools on the market, there are several different types of finish nailers available to you. Each finish nailer can be used for a different purpose, so be sure you do some research on which type you think you would use most. The three types of finish nailers include pneumatic finish nailers, gas finish nailers, and electric finish nailers. Some of these finish nailers have perks that others do not, and some of them are better suited for certain purposes over another type. Here we will take a look at these three different types of finish nailers and see which ones would work best for certain projects, including the benefits of each. A pneumatic finish nailer is a finish nailer that is powered by compressed air, butane, or propane. A pneumatic finish nailer is a finish nailer that will allow you to easily position the item that you are working on (such as a piece of trim) with only one of your hands, and place a finishing nail into it easily with the other hand. The amount of speed that is given with a pneumatic finish nailer is superior to that of a hammer, and you can definitely get the job done faster. As opposed to heavier grade finish nailers, a pneumatic finish nailer is ideal for lighter jobs like trim and baseboards, but can also be used for a little heavier material like molding on the walls. While it is easy to use and takes no electiricity, you will need to keep small tanks of propane, butane, or compressed air on hand when using these types of finish nailers. An electric finish nailer works exactly like the name implies - it runs on electricity and is plugged into a wall outlet or other nearby grounded outlet. This is a great idea if you plan on using it for extended periods of time or don't really want to have to worry about changing propane, butane, or compressed air tanks on a regular basis. This gives you more opportunity to transport the electric finish nailer to other homes or places where you would like to use it without having to worry about picking up more canisters or transporting more than absolutely necessary. A gas finish nailer, like a gas powered chainsaw or lawn mower, is a very popular item in the do it yourself tool industry. A gas finish nailer has gained popularity as it is very portable and does not require any source of electricity - perfect for those who plan on taking their finish nailer with them to do projects outside of their home, or simply to not have to worry about having access to electricity while using their finish nailer. A gas finish nailer is also handy if you do not wish to have to wrory about using battery power to run your finish nailer. In the world of do it yourself tools, a common question is that of "What is the difference between a brad nailer and a finish nailer?" Well, there are a few differences, and knowing these differences can really have an affect on whatever you are creating. When choosing a nailer, either a brad nailer or a finish nailer, there are a lot of differences between the two that can really change the finished product that you are creating. Because of this, it is important to make sure you know the differences between the two, as well as which one of these tools will be the correct tool for the job that you are working on. First of all, a brad nailer and a finish nailer and roughly the same size and usually look quite similar, which causes a lot of confusion between the two, especially to the novice. While the brad nailer is just a hair smaller than a finish nailer, you might wonder why you would need to have either one of the other, and why you couldn't just use them interchangeably. Here we are going to take a look at why they cannot be used interchangeably. The brad nailer uses - you guessed it - brads, instead of finishing nails. Brads are smaller than finishing nails. In fact, they are a more lightweight type of nail that is typically used to install trim on walls and floors, or to do lighter projects, such as crafts. Many people like using brad nailers to do these kinds of jobs, especially for installing very lightweight trim and decorative aspects, because the heads and the actual point of the nail itself is so small, that it is difficult to see. When you use a finish nailer, you often need to apply some wood putty or add some paint to cover the head of the nail, while with brads you often cannot notice them at all. So when is the ideal time to use a finish nailer? Using a finish nailer is ideal when you are looking at using heavier trim, tiles, or need something with a lot stronger of a holding power to keep your nails in place. Finish nailers might not be ideal for delicate projects, but they can definitely hold up when you are faced with needing a tougher nail! Finish nailers are also popular when installing drywall, as the nails can easily hold it in place, whereas a brad nailer will not be able to support the weight. Choosing the best finish nailer might seem like a daunting task! Here are some important facts to keep in mind when you are looking to add a finish nailer to your tool collection. While all of these sizes have their purposes (for example, using a 23 gauge nail can be more ideal for drywall or heavy construction projects), 15 gauge seems to be one of the most popular sizes on the market, as it can be used for a variety of difference purposes without being overkill. Straight finish nailers and angled finish nailers have different angled nail magazines - a straight finish nailer's magazine loads straight, while the angled nailer's magazine loads on an angle. There are also a few other differences, including the fact that a straight finish nailer tends to shoot thinner nails and is less expensive than an angled nailer, which can fit into tighter corners and shoots a thicker, more accurate nail. Cordless nailers have a lot of advantages over corded nailers, with the number one being that you can take them anywhere and do not have to worry about plugging the nailer into an outlet in order to use. The drawback is the fact that you need to keep an eye on how much gas, propane, or compressed air you have, and when you need to add more to the nailer. Cordless nailers are ideal if you do a lot of jobs out of the house. As we discussed in the above section marked straight nailers vs. angled nailers, straight nailers tend to fire the nails straighter and work great for lightweight trim and the such. Angled nailers will fire the nail in a angled method, helping it get deeper into the wood and giving it a little boost of holding power over other firing methods, making them better candidates for heavier duty work. The selectable trigger on a finish nailer can be a big deal for some. When you hear the term selectable trigger, remember that it means the trigger on your finish nailer can change from contact trip to sequential trip. A Selectable trigger allows you to choose either of these methods, which each have their pros and cons. While a contact trip trigger is one of the most popular varieties, the sequential trip trigger tends to be safer and easier to use. A dry fire lock out is a great feature to have is you spend a lot of time rapidly firing your finish nailer gun. The dry fire lock out feature prevents your nail gun from continuing to fire when there are no more nails left in the magazine, which can cause plenty of frustration and sometimes even damage the finish nailer. When the dry fire lock out feature is enabled, the nail gun with cease firing so that you know you need to add more nails. Finish nailers have exhaust ports or mechanisms that allow them to cease overheating and direct all kinds of dust, dirt, and debris away from the nailer while you are working in incredibly dusty conditions. The exhaust system also works to keep these particles away from the person operating the finish nailer. Depth adjustments on a nail finisher are ideal for those who are going to be working with a variety of different materials. The adjustment allows you to choose just how precise and on point that you need the finish nailer to work, and how deep into the item that the nailer needs to reach. For example, you can choose to get a deeper reach when using the finish nailer on drywall as opposed to a simple trim. Since all finish nailers can get jammed every now and again, it is important to find a finish nailer that will provide you with easy relief from that jam. A tool free jam clearing feature on a finish nailer allows you to easily clear the jam and get back to work without having to pause and find tools to clear it. Like most power tools, there are brands that are more popular than others. However, they also tend to cost a bit more, but in the long fun they can really come through. Price is something that will need to be considered when you are looking to purchase a finish nailer. If you are planning on using the finish nailer on a regular basis for plenty of projects, then you might want to invest in a higher end and often pricier finish nailer. If you are only looking for something for a one time job, you might be more comfortable with purchasing a cheaper option. With a lot of brands, you get a great warranty and even options for repair services, which can lengthen the life of your finish nailer. While buying used or a lesser known brand can be easier on your wallet, if you run into technical difficulties later after purchase you might not have the best options for warranty and repair services than you would if you purchased a higher brand or a brand new finish nailer. 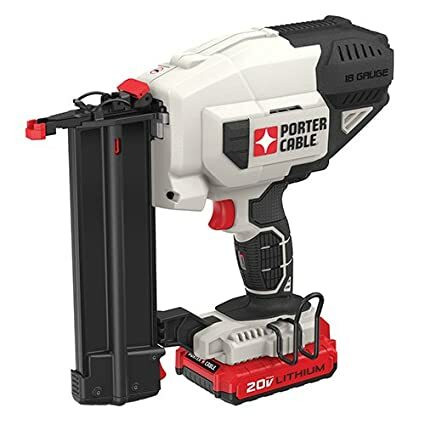 The Porter-Cable PCC790LA 20V Max Lithium 18GA Cordless Brad Nailer Kit is a great way to go if you are looking for a kit to get you started with a brad nailer. This cordless model does not require any kind of compressed air or butane - instead, it is powered by a battery, which can easily be recharged. The depth adjustment wheel is a great way to make sure you get accurate brad placement each time. This model features a tool free release lever and jam release so that you can carry on with your project without any down time. The three year limited warranty protects against manufacture defects and provides you with a great option for repairs if needed. Multifunctional LED lights help you tell when your battery needs to be charged. Finding the correct size nails to go with the brad nailer (18 GA) can be a little more difficult as opposed to other varieties of brad nailers and finish nailers, so you might want to stock up on the correct size when you do find them. Combo Kit is a great finish nailer that provides an angle finish for your nails, and is powered by compressed air, so you don't have to worry about tripping over any cords while you are doing your finishing job. Whether you are planning on using this finish nailer for craft projects or you really want to get into fixing up your home, you have the option to use nails that vary in size to get the perfect results every time. The canvas carrying bag helps you keep your nailer in top working order. 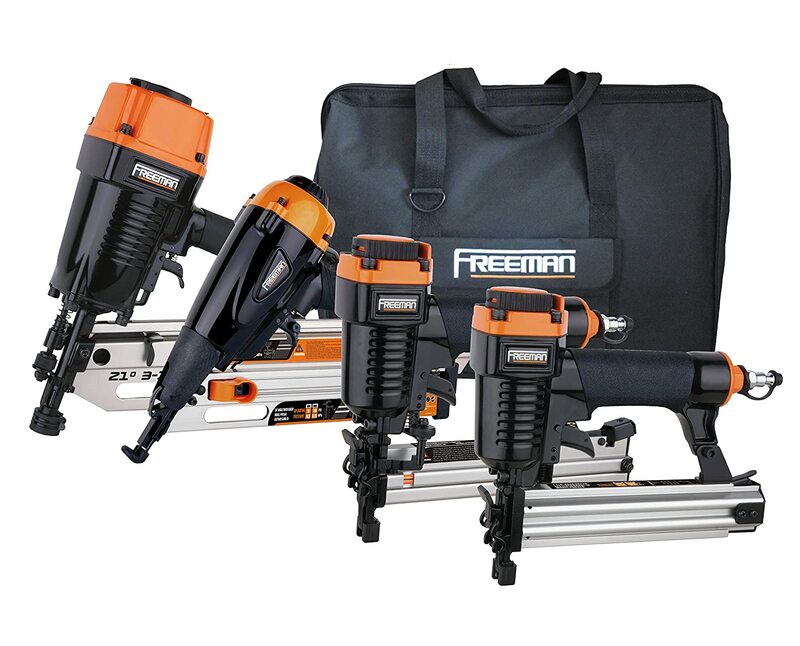 There are so many options with this kit that you will be able to get just about any job done with ease, whether using a brad nailer or a more heavy duty finish nailer. On the brad finish nailer part of this kit, the brad nails tend to jam a bit here and there, causing a bit of frustration for the operator. It is always important to make sure that your finish nailer is well maintained and free of any technical flaws before use. 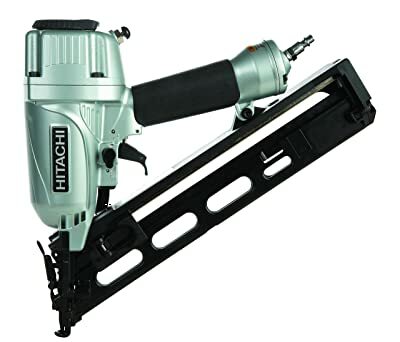 Hitachi is another well known company for power tools, and this Hitachi NT65MAR 1-1/4 inch to 2-1/2 inch 15-gauge angled finish nailer with air duster is one of the top 15 gauge finish nailers on the market. This attractively stylish finish nailer features an air duster to help clear away dust and debris before you even begin working. The angled finish style of shooting allows you to use this accurately in different areas of your home or on different projects. The tool free jam release is an amazing addition to this power tool allows you to have a frustration free experience while using. The selective switch and tool less drive dial gives you the chance to adjust for any surface. This model also features a 360 degree rotating exhaust port. The nail magazine is an angled magazine. This finish nailer does have a known issue with jamming frequently. While it is easy to clear the jams thanks to the tool free jam clearing feature, it can get frustrating to have to clear jams often. 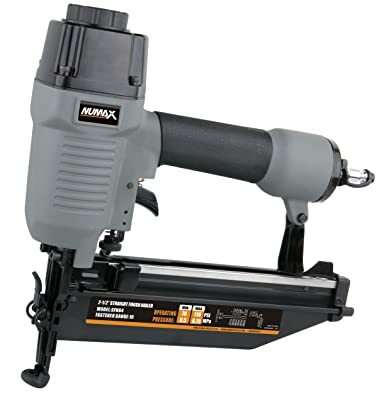 If you are looking fro an easy to use straight finish nailer for crafts, simple projects, or for a beginning do it yourself nail finisher, this NuMax SFN64 Straight Finish Nailer 16 Gauge is a great choice to make. This simple to use finish nailer works great from indoor trim to cabinetry to furniture. This model can use 16 gauge finish nails in sizes one inch through two and a half inches in length. The quick jam release is easy to use and makes using the tool simpler, and you will love the 360 degree adjustable rotating exhaust, that keeps dust and debris away from your face. The lightweight aluminum design makes using this tool for long periods of time much more comfortable and easy. The compressed air powered tool is a must have for all homes! Because this NuMax finish nailer is not as common of a brand and therefore might not be of as high quality. Jams can happen frequently, but are easily remedied thanks to the jam clearing technology. 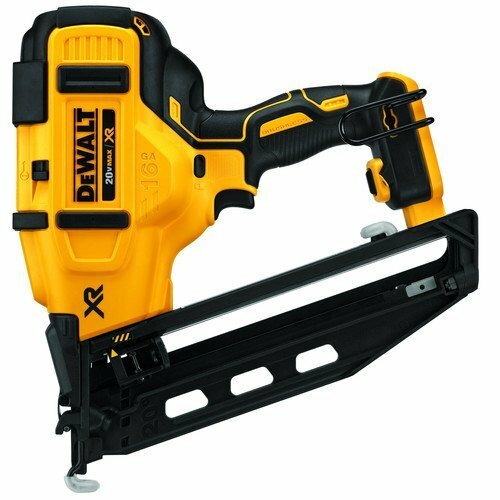 From a highly trusted and reputable name in home improvement equipment, the Dewalt DCN660B 20V Max Cordless Lithium-Ion 16 Gauge Angled Finish Nailer is one of the most fantastic nailers that you can find on the market today, especially cordless! The lithium-ion battery inside the nailer allows you to easily use your power tool without worrying about tripping over cords or constantly replacing compressed air cartridges. The angled finish of this finish nailer allows you to get your nails fired accurately and deeply each and every time. The lightweight tool is a great investment for your do it yourself tool cabinet. While this model has been an improvement on previous models in many ways, it is important to note that it does not seem to hold up to normal use quite as much as its predecessors. The BOSTITCH BTFP72156 Smart Point 15GA FN Style Angle Finish Nailer Kit features a smart point technology that allows you to get the perfect placement of your nail each time, as the nailer has a smaller nose and there is no need to constantly press the trigger. The tool free jam release is a favorite among those who are serious about their power tools, and this model delivers that. The dial a depth control mechanism allows you to choose the depth you are planning on placing your finish nails so that you get the most accurate fit each time. This model is air powered. This kit comes with everything you need to get started, including a carrying case to keep everything dust free and ready to go. The BOSTITCH BTFP72156 has been known to jam a bit more than other models, but thanks to the hands and tool free jam release, it is easy to clear the jam and get back to focusing on the task at hand. 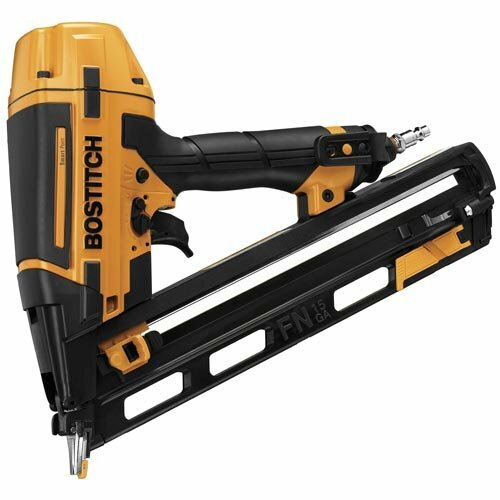 This unique finish nailer features a new kind of in-can fuel system that is easy to change and can even be used with older models. 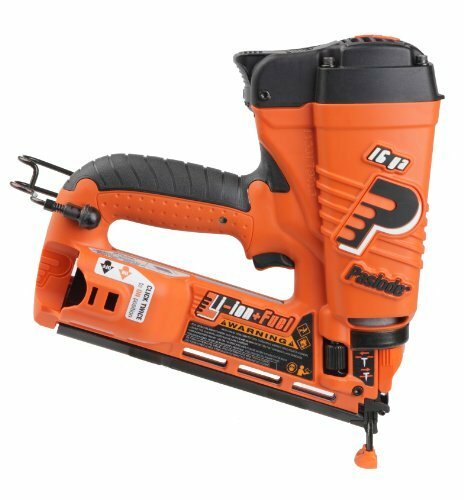 The Paslode 902400 Cordless 16g Angled Lithium Ion Finish Nailer is a beast when it comes to power, and you will be quite surprised by the light weight of the unit - only four and a half pounds total. The unit features a professional grade depth of drive adjustment, allowing you to get the perfect depth and accurate precision each and every time you are working on a project. The heavy duty design of this finish nailer allows it to easily stand up to drops and abuse on the job site without worrying about damaging the unit. The Paslode 902400 cordless has a tendency to jam frequently, and it can be a hassle to have to keep stopping the job to clear away jams. In conclusion, it might seem like purchasing a finish nailer can be a difficult process, as there are many features to consider. Finish nailers can be a handy household tool, whether you plan on using it for a one time project or if you want to learn how to fix things around your home and others. From novices to experts, finish nailers can be a great addition to your tool closet. This guide has covered all of the basic features, from straight to angled firing, jam clearing, exhaust, different power types, and has even given you a list of some of the best finish nailers of 2017. For me, the choice is quite simple and it all depends on what you want to do. If you don’t need the mobility and want to work for a longer period of time then you need an electric finish nailer. If you want mobility then grab a gas finish nailer. I like to have both a straight and angled nailer around. I always seem to need both and while you can do everything with a straight one, the angled nailer will do a far better job in tight corners so I prefer it.